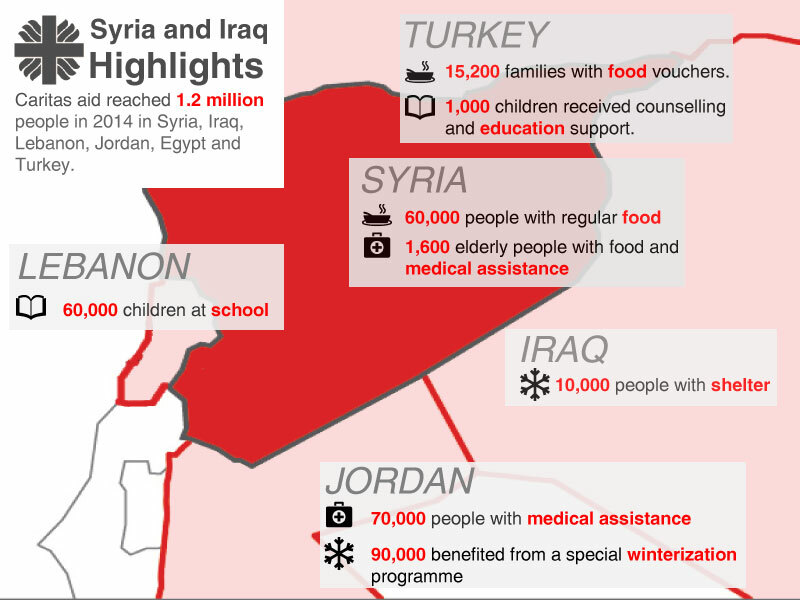 Caritas aims to increase its work in Syria, Iraq and across the Middle East in 2015 as the conflict in Syria enters into its fifth year with no solution in sight. The Caritas confederation of Catholic aid agencies operating in Syria, Iraq, Lebanon, Jordan, Egypt and Turkey reached 1.2 million people in 2014 with aid through national Caritas and Church partners. Caritas plans are in place to scale up the humanitarian response even more if funds can be raised. In 2014, the Caritas humanitarian response in Syria, Iraq and the neighbouring countries has been the combined effort of 55 national and international organisations. Caritas Syria President Bishop Antoine Audo of Aleppo said last year was the “hardest of all”. The humanitarian tragedy unfolding across the region is likely to deteriorate in 2015 with no peace initiative on the table and aid programmes facing cuts. “Half of Syria’s inhabitants are either internally displaced or are refugees. Eighty percent of the workforce doesn’t work. The rich have left, the middle class has become poor and the poor have become destitute,” said Bishop Audo. The violence has left 12.2 million Syrians in need of assistance, 7.6 million forced from their homes inside the country and 3.8 million who are living in neighbouring countries as refugees. Conflict has spread across the region, especially in Iraq where 2 million people were forced to flee last year. “Enough really is enough. There is great sadness in Syria at what has happened. It’s difficult for me to think about the hopes for the future of the next generation of Syrians,” said Bishop Audo. Critical funding shortages means aid-dependent Syrians are already facing cuts to their food assistance. Caritas Internationalis says the international community must provide additional resources so aid agencies can meet the basic needs of the affected population and all those who have left the country. Pope Francis called this month for “everyone, in line with their possibilities, to act to alleviate the suffering” in Syria and Iraq.